This spring, Community Allies’ ongoing research on commercial district revitalization in majority African American neighborhoods and towns took us to the Pittsburgh Hill District and Cincinnati Over The Rhine neighborhoods. These areas share a common history with many other black communities, as once-thriving areas undermined by irresponsible public policy and "urban renewal." In the 1930s, The Hill was one of the most vibrant African American neighborhoods in the country, with renowned jazz clubs frequented by artists including John Coltrane, Dizzy Gillespie, and Art Blakey. In the 1950s, the City of Pittsburgh demolished the lower half of the district in order to build a new sports arena, displacing thousands of residents and businesses and devastating the fabric of the community. Because of the district’s proximity to downtown, the city intended to push its “renewal” efforts further up the hill. However, residents banded together and declared that the devastation would stop at the corner of Centre Avenue and Crawford Street, just past the arena. The intersection became known as Freedom Corner and was the meeting place for multiple civil rights protests, including the 1963 March On Washington D.C. In 2001, The Freedom Corner Memorial was dedicated, including the stunning “Spiritual Form” sculpture. The Memorial continues to be a source of inspiration and pride for the neighborhood’s revitalization efforts, including the restoration of the historic Granada Theater. During the 1950s in Cincinnati, the city built an expressway through a nearby African American neighborhood, sending thousands of displaced residents into Over The Rhine. Overcrowding soon fostered poverty and crime. 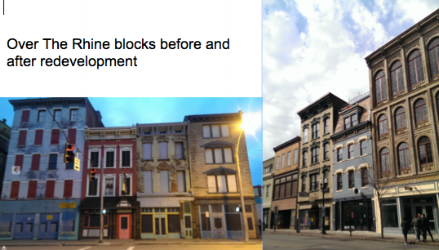 The city declined to invest in OTR for decades, and the neighborhood’s historic architecture deteriorated. Less than fifteen years ago, Over The Rhine was considered one of the country’s most dangerous neighborhoods. As with the Hill District, Over the Rhine’s proximity to downtown made it attractive to developers. In the last decade, millions of dollars have been invested into property rehabilitation, streetscape, and business attraction and incubation. The results are stunning, both in the Cinderella-like transformation of the strip from urban decay to hip and trendy, and in the change in the community’s composition: over 70% of residents of Over The Rhine have been displaced in the last ten years. 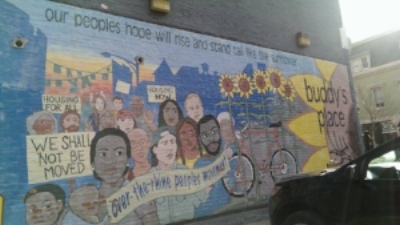 Community Allies will be writing more about Cincinnati and Pittsburgh in the coming months – especially about the inspiring efforts of organizations such as Cincinnati’s MORTAR and Pittsburgh’s Hill Community Development Corporation to ensure that revitalization efforts benefit the indigenous residents. If you know of successful or in-progress revitalization efforts in primarily African American neighborhoods or towns, where the businesses remain primarily black-owned and local-serving, we’d love to talk to you.